The epithelial cells of the choroid plexus (CP) form the blood-cerebrospinal fluid barrier (BCSFB). An in vitro model of the BCSFB employs human choroid plexus papilloma (HIBCPP) cells. This article describes culturing and basolateral infection of HIBCPP cells using a cell culture filter insert system. Dinner, S., Borkowski, J., Stump-Guthier, C., Ishikawa, H., Tenenbaum, T., Schroten, H., Schwerk, C. A Choroid Plexus Epithelial Cell-based Model of the Human Blood-Cerebrospinal Fluid Barrier to Study Bacterial Infection from the Basolateral Side. J. Vis. Exp. (111), e54061, doi:10.3791/54061 (2016). The epithelial cells of the choroid plexus (CP), located in the ventricular system of the brain, form the blood-cerebrospinal fluid barrier (BCSFB). The BCSFB functions in separating the cerebrospinal fluid (CSF) from the blood and restricting the molecular exchange to a minimum extent. An in vitro model of the BCSFB is based on cells derived from a human choroid plexus papilloma (HIBCPP). HIBCPP cells display typical barrier functions including formation of tight junctions (TJs), development of a transepithelial electrical resistance (TEER), as well as minor permeabilities for macromolecules. There are several pathogens that can enter the central nervous system (CNS) via the BCSFB and subsequently cause severe disease like meningitis. One of these pathogens is Neisseria meningitidis (N. meningitidis), a human-specific bacterium. Employing the HIBCPP cells in an inverted cell culture filter insert system enables to study interactions of pathogens with cells of the BCSFB from the basolateral cell side, which is relevant in vivo. In this article, we describe seeding and culturing of HIBCPP cells on cell culture inserts. Further, infection of the cells with N. meningitidis along with analysis of invaded and adhered bacteria via double immunofluorescence is demonstrated. As the cells of the CP are also involved in other diseases, including neurodegenerative disorders like Alzheimer`s disease and Multiple Sclerosis, as well as during the brain metastasis of tumor cells, the model system can also be applied in other fields of research. It provides the potential to decipher molecular mechanisms and to identify novel therapeutic targets. The blood-cerebrospinal fluid barrier (BCSFB) is one of the three barrier sites between the blood and the brain1. Its morphological correlate are the epithelial cells of the choroid plexus (CP)2,3, an endothelial-epithelial convolute, which is strongly vascularized and located in the ventricles of the brain. The CP serves to produce the cerebrospinal fluid (CSF) as well as to separate the latter from the blood. In order to achieve barrier function, the CP epithelial cells show a low pinocytotic activity, express specific transporters, and are densely connected by a continuous network of tight junctions (TJs)2,3. Human choroid plexus papilloma (HIBCPP) cells, derived from a malignant choroid plexus papilloma of a Japanese woman4, were used to construct a functional in vitro model of the BCSFB. HIBCPP cells show a couple of characteristics of a functional BCSFB as the formation of TJ strands, the development of a high transepithelial membrane potential that can be determined as transepithelial electrical resistance (TEER), and minor permeabilities for macromolecules. Moreover, HIBCPP cells express characteristic transporters, which may serve to regulate the ionic microenvironment, and show apical/basolateral polarity5,6,7. The BCSFB has been shown to function as an entry site for pathogens (bacteria, viruses, and fungi) into the central nervous system (CNS)8. The invasion of pathogens, including Neisseria meningitidis (N. meningitidis), a Gram-negative bacterium, can cause severe diseases like meningitis. Evidence that it overcomes the protective epithelial barrier of the CP is supported by histopathological observations in patients with meningococcal disease exhibiting increased amounts of meningococci in the vessels and CP epithelial cells9,10. To gain entry into host cells bacteria often hijack endocytotic mechanisms, which are mediated or triggered by specific surface receptors located on the host cells. Since interactions of pathogens with these receptors can be species specific11, animal models can only be consulted to a restricted extent. The HIBCPP cell line provides the opportunity to study the invasion process as well as the underlying molecular mechanisms in a human model system. Employing cell culture inserts enables us to analyze interactions of pathogens with host cells from two distinct cell sides. Many bacteria, including N. meningitidis, are strongly subject to the impact of gravity during infection assays. For optimal interaction of pathogens with the HIBCPP cells during the assays, the bacteria are initially added into the upper compartment of the cell culture filter insert system. To enable infection from the apical or the basolateral cell side, respectively, two variations of the in vitro system have been established: In the standard system HIBCPP cells are seeded into the upper compartment of the filter insert, mimicking the situation when microorganisms are located on the CSF-side and get into contact with the apical side of the cells (Figure 1A, C). In contrast, using the HIBCPP cells in an inverted cell culture filter insert system reflects the conditions when bacteria have entered the blood stream. Microorganisms disseminate in the blood and encounter CP epithelial cells from the basolateral side (Figure 1B, D). Noteworthy, in this model system it has been shown that bacteria invade HIBCPP cells in a polar fashion specifically from the basolateral cell side5,7. Subsequently to infection of the CP, the invaded pathogens can be recognized by the innate immune system through ligation to pattern-recognition receptors (PRRs). Well-described members of the PRRs belong to the Toll-like receptor (TLR) family. TLRs can bind to characteristic structures of infectious microorganisms, which are termed pathogen-associated molecular patterns (PAMPs). Ligation of the receptors leads to activation of host cell signaling cascades that trigger expression of cytokines and chemokines12, which in turn stimulate transmigration of immune cells across the BCSFB13,14. It has been shown that HIBCPP cells express several TLRs at mRNA level and that infection with N. meningitidis results in secretion of several cytokines and chemokines, including CXCL1-3, IL6, IL8 and TNFα15,16. Here, we describe cultivation and infection of the human cell line HIBCPP in an inverted cell culture insert system that mimics the BCSFB. This model system enables to study interactions of pathogens with the in vivo relevant basolateral cell side as well as the subsequent cellular response. Pre-warm DMEM/ F12 (Ham) supplemented with 5 µg/ml insulin, 100 U/ml penicillin, 100 µg/ml streptomycin and 10% fetal calf serum (FCS). Use sterile forceps to place 0.33 cm² growth area cell culture filter inserts with a pore size of 3 µm upside down into a 12-well plate (Figure 1E). Fill medium into the lower compartment of the cell culture filter insert (about 3 ml) and 100 µl on top of the filter insert. Flood the plate as well as the lower compartment with medium. Aspirate the excessive medium in such a way that the lower compartment of the filter insert stays filled (Figure 1E). Note: It is recommended to use a serological pipette for this step. Cover 12-well plate with the lid and transfer the prepared cell culture filter inserts to the incubator, 37 °C, 5% CO2 until addition of cells. Prepare DMEM/ F12 (Ham) supplemented with 5 µg/ml, 100 U/ml penicillin, 100 µg/ml streptomycin and 10% FCS. Pre-warm medium and PBS in a 37 °C water bath. Aspirate medium from flask. Add 10 ml PBS to the flask and swirl. Repeat this step once. Add 3 ml 0.25% trypsin-EDTA to the flask and swirl. Place into the incubator, 37 °C, 5% CO2. After approximately 20 min remove the flask from the incubator. Ensure that the cells are detached from the bottom of the flask and display a round shape when surveyed with the microscope. Note: The cells do not detach completely from each other and are often found in agglomerates. It is recommended to use the cells up to passage 38. To stop trypsinization add 17 ml medium. Resuspend the cells by pipetting up and down and transfer the suspension into a 50 ml tube. Centrifuge at 50 x g for 10 min at room temperature. Resuspend the cells in an appropriate volume of medium and count the cells by using a hemocytometer. Note: The concentration of resuspended HIBCPP cells should be 1 x 106 cells/ml. For maintenance of HIBCPP cells it is suggested to transfer an amount of 1-6 x 106 cells in 10 ml medium to a T75-flask. Change medium every second day. On top of each inverted filter insert (i.e. the bottom side of the filter) add 80 µl of cell suspension (i.e. 8 x 104 cells) (Figure 1E). Note: Make sure that the cells are evenly distributed in the suspension by inverting the tube before seeding. Cover the seeded-cell culture filter inserts with the lid of the 12-well plate and transfer to the incubator, 37 °C, 5% CO2. On the first day, fill 1 ml medium into the wells of a 24-well plate. Lift the cell culture filter inserts by using forceps out of the 12-well plate, discard the medium inside, turn the filter inserts and place them in the standard orientation into the prepared 24-well plate (Figure 1E). Place the cells into fresh medium every second day. Prepare 24-wells with fresh medium and transfer the filter inserts to it. Fill inserts with 0.5 ml fresh medium. Check TEER every day as described in section 4. When TEER values of HIBCPP seeded-cells on cell culture inserts exceeds 70 Ω x cm² (approximately 4 days after seeding), then continue cell culture in medium containing 1% FCS and 5 µg/ml insulin. Prepare 24-well plates with 1 ml medium for each well. Transfer filter inserts to the prepared wells and exchange medium in the upper compartment. Note: This serum withdrawal after confluency leads to the formation of a higher membrane potential. Aspirate medium from filter compartment, transfer to the prepared well and fill with 500 µl medium. Repeat this step once. Put the cells overnight into the incubator, 37 °C, 5% CO2. Immerse the electrode tips of epithelial tissue voltohmmeter for 15 min in 80% ethanol. Transfer voltohmmeter under the hood and let electrode dry for a moment. Place electrode into respective culture medium used for the cells for another 15 min to equilibrate. Perform measurements by positioning the longer arm of the electrode so that it touches the bottom of the lower compartment each time, place the shorter arm into the filter insert compartment. Note: Resistance values of cell culture filter inserts without cells in medium should be used as blank values ((measured value (Ω) – blank value (Ω)) x filter surface (i.e. 0.33 cm²)). After measuring place the electrode back into 80% ethanol for 15 min. Store in a dry tube. Dissolve 1 g FITC-Inulin in 200 ml culture medium supplemented with 5 µg/ml insulin 1% FCS. Apply 50 µg/ml of the solution into the upper filter compartment before infection of the cells. After infection collect medium samples from the lower well to determine how much Inulin passed from the filter compartment through the cell layer. Prepare a FITC-Inulin standard solution and perform 1:2 dilutions, 10 times (100%, 50%, 25%, 12.5%, 6.25%, 3.13%, 1.56%, 0.78%, 0.39%, 0.2% and 0%). Determine fluorescence by measurement of all samples in microplate reader. One day prior to the experiment, scrape the frozen N. meningitidis strains off a glycerol-stock and streak out on Chocolate Agar with Vitox. Grow overnight in the incubator, at 37 °C, with 5% CO2. Extract 20-30 colonies from the overnight culture and transfer into a tube containing 8 ml Proteose Peptone Medium supplemented with 0.042% NaHCO3, 0.01 M MgCl2 and 1% Polyvitex. Shake the bacteria for 1.25 hr at 220 rpm, 37 °C. Pellet the bacteria by centrifugation at 2,684 g for 10 min at room temperature. Discard supernatant and resuspend the bacterial pellet with 8 ml serum-free medium. Vortex to ensure an even suspension. To determine culture density, measure a dilution of 1:10 at an optical density (OD) of 600 nm. Adjust the bacterial suspension to an OD600 of 0.1. Note: This suspension contains approx. 1 x 108 CFU/ml. To confirm the bacterial cell concentration, dilute the suspension stepwise (1:10) up to a dilution of 10-5 and plate onto Chocolate Agar plates. Note: Similar serial dilutions need to be performed to calculate bacterial growth curves. After continuing cell culture in medium containing 1% FCS and 5 µg/ml insulin, measure cells every day using an epithelial tissue voltohmmeter. If cells have reached a TEER of around 500 Ω x cm² , carry out the infection. Infect the cells with the prepared bacterial suspension at a multiplicity of infection (MOI) of 10. Store the infected cells in the incubator, at 37 °C, with 5% CO2 for the indicated period of time. Note: The MOI can be calculated by taking into account the number of cells per cell culture filter insert at confluence (1.21 x 106 cells/cm2). Stop the infection by washing three times with 500 µl serum-free medium (SFM) containing 1% bovine serum albumin (BSA) applied to the filter compartment, 1 ml to the lower compartment. Block with 500 µl SFM containing 1% BSA buffer in the filter compartment and 1 ml in the lower compartment for 20 min at room temperature to prevent adherence of antibodies to unspecific binding sites. Incubate with 100 µl primary antibody anti N. meningtidis α-OMP (1:200) in the filter compartment and 500 µl in the lower compartment for 20 min at room temperature. Note: If required, the antibody concentration needs to be titrated. Wash the cells by aspirating the medium from the filter compartment, transfer the filter insert to a prepared well with 1 ml SFM containing 1% BSA and fill the emptied filter compartment with 500 µl SFM containing 1% BSA. Repeat this step twice. Fix cells with 500 µl 4% formaldehyde in the filter compartment, 1 ml in the lower compartment for 10 min at room temperature. Wash the cells by aspirating the medium from the filter compartment, transfer the filter insert to a prepared well with 1 ml PBS and fill the emptied filter compartment with 500 µl PBS. Repeat this step once. Note: Samples can be stored overnight in PBS at 4 °C. Cut fixed cell culture filters out of the inserts and wash with 250 µl PBS containing 1% BSA. Incubate cells for 15 min at room temperature with 250 µl fluorescent labeled (excitation wavelength 594 nm) secondary antibody chicken anti rabbit (1:500) to stain extracellular bacteria. Permeabilize cells with 250 µl PBS containing 1% BSA and 0.5% Triton X-100 for 1 hr at room temperature. Wash cells three times with 250 µl PBS containing 1% BSA. Incubate with 250 µl primary antibody anti N. meningitidis α-OMP (1:200) for 30 min to stain extra- and intracellular bacteria. Wash cells three times with 250 µl PBS containing 1% BSA. Apply 250 µl of fluorescent labeled (excitation wavelength 488 nm) secondary antibody (1:500), fluorescent labeled (excitation wavelength 660 nm) Phalloidin (1:250) and 4´,6-diamidino-2-phenylindole dihydrochloride (DAPI) (1:50,000) for 1 hr at room temperature to stain extra- and intracellular bacteria, actin cytoskeleton and nuclei. Wash cells three times with 250 µl PBS containing 1% BSA. Embed the cells in mounting medium and store at 4 °C until examination via microscope. Determine number of invaded bacteria per predefined field. Do this by counting 20 fields per filter membrane. Calculate the percentage of invaded bacteria. Note: Multiply the mean bacterial count of the 20 microscopic fields with an area coefficient. The result expresses the amount of total bacteria present in a 0.33 cm² cell culture filter insert. Divide this value by the amount of bacteria grown in media during the duration of infection. Here we describe culturing and infection of HIBCPP cells in an inverted cell culture insert system. This model allows us to study invasion mechanisms and the underlying molecular signaling pathways from the basolateral cell side, reproducing a physiological situation of bacteria disseminating and entering epithelial cells via the blood stream (Figure 1). The HIBCPP cells display certain barrier functions, which enable them to restrict molecular exchange to a minimal level. This is achieved by the expression of adherens junction (AJ) and tight junction (TJ) proteins. 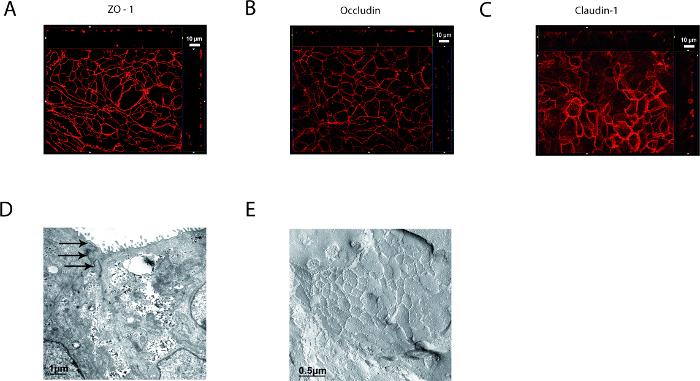 Immunofluorescence analysis of the TJ-associated proteins Occludin, Claudin and ZO-1 revealed an uninterrupted signal at the sites of cell-cell contact, demonstrating that the cells are interconnected by continuous strands of TJs (Figure 2A, B, C). A detailed impression of the TJ morphology has been obtained by transmission (Figure 2D) and freeze fracture electron microscopy (Figure 2E), which shows that TJs are located between the cells and form broad, meshed cable-like structures. TJs of epithelial cells also act as a fence to segregate apical and basolateral membrane domains, therefore contributing to cellular polarity. Among the proteins, which are expressed exclusively on the basolateral cell side of HIBCPP cells, are the AJ protein E-Cadherin (Ecad) and the hepatocyte growth factor receptor (HGF/Met) as shown by immunofluorescence analysis in Figure 3, pointing to a certain level of polarity. When cultured under appropriate conditions HIBCPP cells also exhibit typical barrier functions of the BCSFB like formation of a membrane potential as well as a low permeability for macromolecules. Determination of the membrane potential can be achieved by measurement of the TEER with the use of a voltohmmeter. The permeability of the cell layer is quantified by application of FITC-labelled Inulin, a sugar that passes the layer in a paracellular fashion. 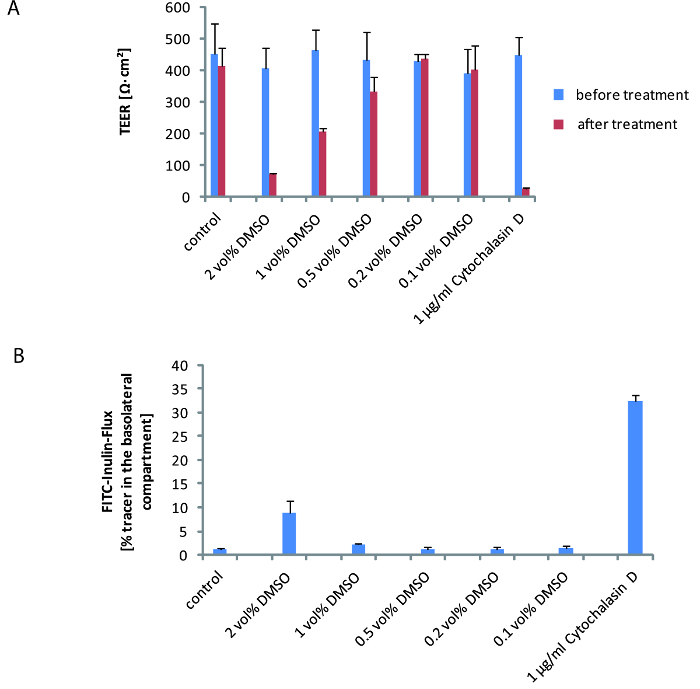 Here, we show results of a representative experiment, which demonstrates that these barrier functions remain stable and show no affection by standard concentrations of Dimethyl sulfoxide (DMSO), a common solvent for cell stimulating chemicals. As can be seen in Figure 4A, TEER values were recorded before and after exposure of HIBCPP cells to DMSO. The cells displayed a high membrane potential that reached up to about 500 Ω x cm² at the beginning of the experiment for all the conditions. The measured TEER did not change after 2 hr for cells treated with up to 0.2 vol% DMSO. In contrast, TEER values decreased in a dose-dependent manner when higher volumes were applied (Figure 4A). This reduction in membrane potential was concomitant with an increased permeability for macromolecules. Whereas addition of DMSO to HIBCPP cells up to 0.5 vol% did not result in a permeability increase for Inulin, 1 vol% and 2 vol% displayed an effect, although to a restricted extent (Figure 4B). Further, we checked the influence of Cytochalasin D, a potent inhibitor of actin polymerization, on membrane potential and permeability of HIBCPP cells. Treatment of the cells with the 1 µg/ml Cytochalasin D causes a significant drop of TEER values as well as an increase in FITC-Inulin flux (Figure 4A, B). This effect can be explained by the opening of TJs caused by Cytochalasin D.
The HIBCPP cell line as a model of the BCSFB can be employed to study interactions of pathogens and the barrier-forming epithelial cells. There is evidence that the bacterium N. meningitidis gains entry into the CNS by crossing the BCSFB. It has been shown that Neisseria invade HIBCPP cells specifically from the basolateral cell side, which is relevant in vivo. During this process the bacterial capsule plays an important role: Capsule-lacking mutants show increased invasion into HIBCPP cells5. In the following we compared basolateral invasion of the MC58 strain17, its isogenic mutant MC58siaD- deficient for capsule production17 and the unencapsulated carrier isolate α1419,20. HIBCPP cells were infected with the strains mentioned above over a time course of 4 hr at an MOI of 10. 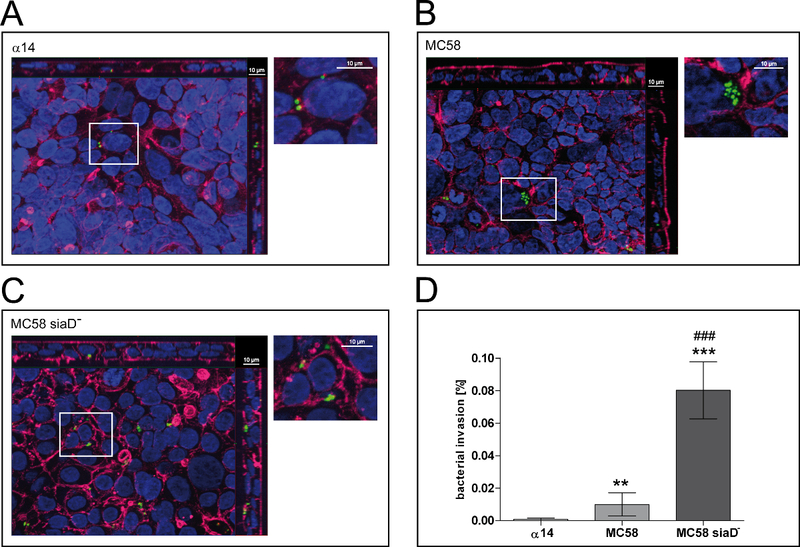 Immunofluorescence analysis revealed significant invasion for the two pathogenic strains MC58 and MC58siaD-, whereas only minor invasion rates were observed for the apathogenic α14 strain (Figure 5A). A representative image of the double immunofluorescence microscopy of HIBCPP cells infected with the respective strain is shown in Figure 5A, B and C.
Figure 1: Standard and Inverted Cell Culture System. In the standard cell culture system (A, C) interaction of bacteria with the CP epithelial cells can be investigated at the apical cell side, which is indicated by microvilli. The inverted cell culture system (B, D) allows us to study bacterial interaction with the basolateral cell membrane, which is involved during bacterial invasion via the bloodstream into the CNS. For the inverted cell culture (E) HIBCPP cells are seeded onto the bottom side of the filter inserts. The lower well including the inner compartment of the filter insert are flooded with medium. Subsequently, the excessive medium is aspirated in such a way that the inner compartment of the filter insert stays filled. On the first day after seeding, cell culture filter inserts are flipped over and filled with medium. Please click here to view a larger version of this figure. Figure 2: HIBCPP Cells Display Continuous Strands of TJs. The TJ proteins ZO-1 (A), Occludin (B) and Claudin-1 (C) were detected in HIBCPP cells. Panels A-C show Apotome images. Center of each panel: xy en face view of the cells; top and right side: cross-sections of several optical slices through the z-plane. Scale bars indicate 10 µm. The TJ structure of HIBCPP cells was analysed by transmission electron microscopy. Cells are inter-connected by TJs, which are indicated by arrows (D). The scale bar indicates 1 µm. Freeze fracture electron microscopy studies visualize closely meshed TJ strands (E). The Scale bar = 0.5 µm. The images in this figure were originally published in Schwerk et al., PloS One 7: e30069, doi: 10.1371/journal.pone.0030069 (2012); re-print with permission. Please click here to view a larger version of this figure. Figure 3: Expression of Receptor Proteins Involved During Invasion of Bacteria in HIBCPP Cells. Immunofluorescence analysis displays expression of Ecad (A) and Met (B) at the basolateral cell side. The pictures show Apotome images. Center of each panel: xy en face view of the cells; top and right side: cross-section of several optical slices through the z-plane. The apical membrane of the HIBCPP cells (indicated by arrows) is positioned towards the top of the top part as well as towards the right of the right side, respectively, of each frame. Scale bars = 10 µm. The data in this figure were also published previously in Gründler et al., Microbes Infect. 15: 291-301, doi: 10.1016/j.micinf.2012.12.005 (2013); re-print with permission. Please click here to view a larger version of this figure. Figure 4: Influence of DMSO and Cytochalasin D on Barrier Function of HIBCPP Cells. Effects on barrier function are determined by measurement of TEER values and FITC-Inulin-Flux. Results are shown for one representative experiment, which was performed in triplicates. HIBCPP cells were treated with DMSO as well as Cytochlalasin D in the indicated amounts for 2 hr. Please click here to view a larger version of this figure. When applied in concentrations up to 0.2 vol%, DMSO does not affect membrane potential (Figure 4A). Concentrations ranging from 0.1 vol% up to 0.5 vol% of DMSO also do not influence paracellular permeability of the cells (Figure 4B). In contrast, 1 µg/ml Cytochalasin D causes a decrease in TEER concomitant with an increase in FITC-Inulin-Flux through the cell layer (Figure 4A, B). Figure 5: Invasion of N. meningitidis into HIBCPP Cells. Double immunofluorescence microscopy shows invaded (green) and adhered (yellow) bacteria. White boxes within images represent the magnified picture detail on the right side. 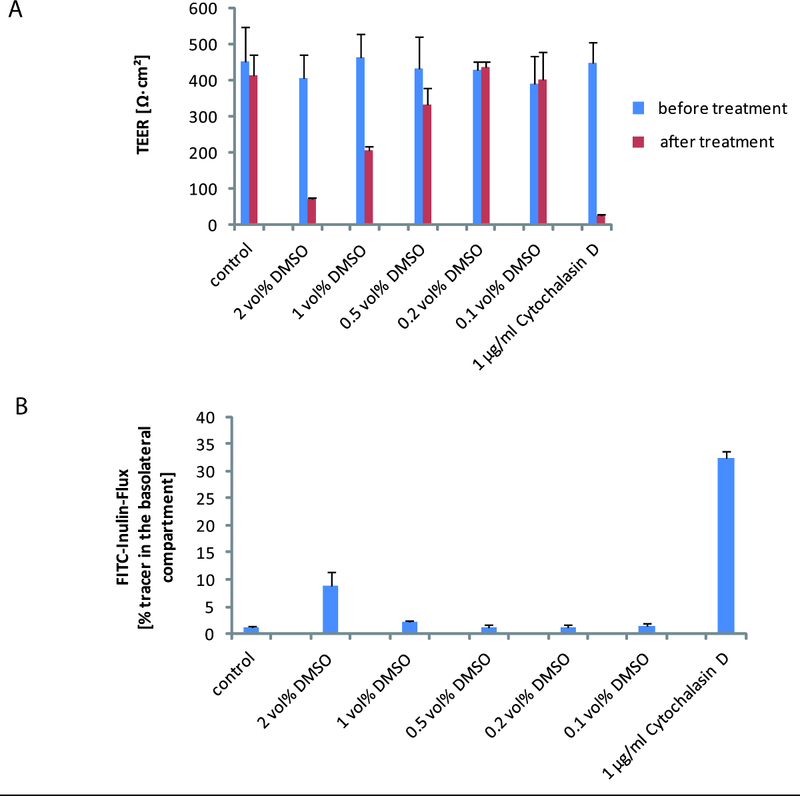 Basolateral invasion was observed for the N. meningitidis strains MC58 (A) and MC58siaD-, deficient for capsule production (B), whereas only a minor invasion rate was determined for α14 (C). The diagram demonstrates that the invasion rates of MC58 and MC58siaD- are highly significant when compared to α14 (**, p <0.01). Extreme significance is displayed when MC58 or MC58siaD-, respectively, were compared to α14 (***, p <0.001) and MC58siaD- was compared to MC58 (###, p <0.001). Scale bars indicate 10 µm. The diagram in D was originally published in Borkowski et al., J Neuroinflammation 11: 163, doi:10.1186/s12974-014-0163-x (2014); re-print with permission. Please click here to view a larger version of this figure. The epithelial cells of the CP form the BCSFB that separates the CSF from the blood2,3. We recently established the HIBCPP cell line as a functional human model of the BCSFB. The cells display important barrier functions of the BCSFB in vitro, including the development of a high membrane potential, a low permeability for macromolecules, as well as the presence of continuous strands of TJs5. The TJ proteins contribute to an apical/basolateral polarity of the cells. The polarity is of high importance for a directed localization of surface receptors as well as specific transporter proteins. We have shown polar localization of the receptors Ecad and Met as well as members of the ATP-binding cassette (ABC) transporter family that maintains a highly controlled microenvironment within the CNS6,7. There are several microorganisms that are able to gain entry into the CNS by overcoming the BCSFB, leading to severe disease including meningitis8. One of the pathogens that are capable of invading into CP epithelial cells is the human-specific Gram-negative bacterium N. meningitidis9,10, which has been shown to enter HIBCPP cells in a polar fashion specifically from the basolateral cell side5. This is the physiologically relevant direction for infection of the brain across the BCSFB when bacteria disseminate and encounter CP epithelial cells from the blood during the course of meningitis. To reflect this situation in vitro, HIBCPP cells are grown on the lower side of the filter. In contrast to the standard filter insert model, where cells are seeded into the upper compartment, this set up of an inverted culture system allows to infect epithelial cells specifically from the basolateral cell side5,21. Basolateral invasion into HIBCPP cells has been observed for the two pathogenic N. meningitidis strains MC58 and MC58siaD-, whereas the non-pathogenic carrier isolate α14 displayed only marginal invasion15. This illustrates that the HIBCPP cell model provides the possibility to scan available mutant libraries for novel virulence factors involved during the invasion process. Noteworthy, it has been demonstrated that other pathogens including L. monocytogenes and Streptococcus suis (S. suis) invade HIBCPP cells in a polar fashion5,7. In order to recognize and respond to invading microorganisms into the CNS, the epithelial cells of the CP express PRRs22,23. TLRs represent an important family within the PRRs. Qualitative RT-PCR analyses demonstrated that HIBCPP cells express several TLRs as well as related co-receptors and the adaptor molecule MyD8815. It has been observed that the receptors TLR2 and TLR4 are involved in the cellular defense reaction to N. meningitidis capsular polysaccharides24. Further results of a microarray approach revealed that HIBCPP cells infected with N. meningitidis display an induction of signal transduction pathways, amongst other factors also involving the transcription regulator IκBζ15, mandatory for expression of certain target genes including il625,26, a pro-inflammatory cytokine. To confirm these findings, HIBCPP cells infected with N. meningitidis in an inverted culture system have been used to investigate the release of cytokines and chemokines. It is known that this process aims to instigate an inflammatory response by activation of the innate immune system13,14. HIBCPP cells produce and secrete cytokines and chemokines, including CXCL1-3, IL6, IL8 and TNFα15,16, which have been described to attract neutrophils and monocytes27. By employing our model system we found that polymorphnuclear neutrophils, monocytes and also T lymphocytes migrate through HIBCPP cells16,28, emphasizing that HIBCPP cells are suitable for deciphering mechanisms of transepithelial migration of immune cells. The herein presented model system also offers the opportunity for modifications. HIBCPP cells can be pretreated with antibodies or chemical inhibitors to identify receptors and signal transduction pathways involved during infection. DMSO, a common solvent for cell stimulating reagents can be applied in appropriate volumes to the HIBCPP cells, which display stable barrier functions that are not affected by the chemical throughout the investigated time course. This property is also relevant for use of the model in pharmaceutical studies. Although we have demonstrated that HIBCPP cells show a certain level of polarity, they will not naturally reflect every single detail of an in vivo model. E.g. the localization of ABC transporter family members only partly matches the expected patterns6, why pharmaceutical applications can probably only be applied to a restricted extent. Also, the HIBCPP cells do not seem to produce CSF (data not shown). Nevertheless, we have found that HIBCPP cells express the proteins Transthyretin, insulin-like growth factor 2 (IGF2) and forkhead box J1 (FOXJ1) on RNA level5, which are characteristic marker proteins for CP epithelial cells29,30,31,32. This observation supports that HIBCPP cells have retained typical properties of CP epithelial cells. Importantly, it should be noted that HIBCPP cells do not present contact inhibition. It is therefore crucial to use the cells for experimentation when appropriate TEER values are reached. Furthermore, the HIBCPP cells should not be used beyond passage 38, since the potential to develop a barrier function seems to drop with higher passages. Finally, to study the impact of cell-cell interactions during infections at the BCSFB a co-culture model consisting of CP epithelial and endothelial would be of high interest, but such a model still needs to be developed. In conclusion, the HIBCPP cell culture model can be used to reveal key invasion pathways and underlying signal transduction pathways, particularly of human-specific pathogens at the BCSFB. As it is known that the epithelial cells of the CP are also involved in neurological degenerative disorders including Alzheimer´s disease as well as Multiple Sclerosis2, and also in brain metastasis of tumor cells33, the system offers in general a great variety of opportunities for investigation of disease-related mechanisms, providing the potential to find novel therapeutic targets. The authors would like to thank Prof. Hartwig Wolburg for performing the electron microscopy. Abott, N. J., Patabendige, A. A. K., Dolman, D. E. M., Yusof, S. R., Begley, D. J. Structure and function of the blood-brain barrier. Neurobiol Dis. 37, 13-25 (2009). Wolburg, H., Paulus, W. Choroid plexus: biology and pathology. Acta Neuropathol. 119, 75-88 (2010). Engelhardt, B., Sorokin, L. The blood-brain and the blood-cerebrospinal fluid barriers: function and dysfunction. Semin Imunopathol. 31, 497-511 (2009). Ishiwata, I., Ishiwata, C., Ishiwata, E., Sato, Y., Kiguchi, K., Tachibana, T., et al. Establishment and characterization of a human malignant choroid plexus papilloma cell line (HIBCPP). Hum Cell. 18, 67-72 (2005). Schwerk, C., Papandreou, T., Schuhmann, D., Nickol, L., Borkowski, J., Steinmann, U., et al. Polar invasion and translocation of Neisseria meningitidis and Streptococcus suis in anovel human model of the blood-cerebrospinal fluid barrier. PloS One. 7, e30069 (2012). Bernd, A., Ott, M., Ishikawa, H., Schroten, H., Schwerk, C., Fricker, G. Characterization of efflux transport proteins of the human choroid plecus papilloma cell line HIBCPP, a functional in vitro model of the blood-cerebrospinal fluid barrier. Pharm Res. (2014). Gründler, T., Quednau, N., Stump, C., Orian-Rousseau, V., Ishikawa, H., Wolburg, H., et al. The surface proteins InlA and InlB are interdependently required for polar basolateral invasion by Listeria monocytogenes in a human model of the blood-cerebrospinal fluid barrier. Microbes Infect. 15, 291-301 (2013). Schwerk, C., Tenenbaum, T., Kwang, S. K., Schroten, H. The choroid plexus - a multi-role player during infectious diseases of the CNS. Front Cell Neurosci. 9, 80 (2015). Pron, B., Taha, M. K., Rambaud, C., Fournet, J. C., Pattey, N., Monnet, J. P., et al. Interaction of Neisseria meningtidis with the components of the blood-brain barrier correlates with increased expression of PilC. J Infect Dis. 176, 1285-1292 (1997). Guarner, J., Greer, P. W., Whitney, A., Shieh, W. J., Fischer, M., White, E. H., Carlone, G. M., et al. Pathogenesis and diagnosis of human meningococcal disease using immunohistochemical and PCR assays assays. Am J Clin Pathol. 122, 754-764 (2004). Pizarro-Cerda, J., Kuhbacher, A., Cossart, P. Entry of Listeria monocytogenes in mammalian epithelial cells: an updated view. Cold Spring Harb Perspect Med. 2, (2012). Beutler, B. Microbe sensing, positive feedback loops and the pathogenesis of inflammatory diseases. Immunol. Rev. 227, 248-263 (2009). Wilson, E. H., Weninger, W., Hunter, C. A. Trafficking of immune cells in the central nervous system. J Clin Invest. 120, 1368-1379 (2010). Meeker, R. B., Williams, K., Killebrew, D. A., Hudson, L. C. Cell trafficking through the choroid plexus. Cell Adh Migr. 6, 390-396 (2012). Borkowski, J., Li, L., Steinmann, U., Quednau, N., Stump-Guthier, C., Weiss, C., et al. Neisseria meningitidis elicits a pro-inflammatory response involving I kappa B zeta in a human blood-cerebrospinal fluid barrier model. J Neuroinflammation. 11, 163 (2014). Steinmann, U., Borkowski, J., Wolburg, H., Schroppel, B., Findeisen, P., Weiss, C., et al. Transmigration of polymorphnuclear neutrophils and monocytes through the human blood-cerebrospinal fluid barrier after bacterial infection in vitro. J Neuroinflammation. 10, 30 (2013). McGuiness, B. T., Clarke, I. N., Lambden, P. R., Barlow, A. K., Poolman, J. T., Heckels, J. E. Point mutation in meningococcal por A gene associated with increased endemic disease. Lancet. 337, 514-517 (1991). Ram, S., Cox, A. D., Wright, J. C., Vogel, U., Getzlaff, S., Boden, R. Neisserial lipopolysaccharide is a target for complement component C4b. inner core phosphoethanolamine residues define C4b linkage specificity. J Biol Chem. 278, 50853-50862 (2003). Claus, H., Maiden, M. C., Maag, R., Frosch, M., Vogel, U. Many carried meningococci lack the genes required for capsule synthesis and transport. Microbiology. 148, 1813-1819 (2002). Claus, H., Maiden, M. C., Wilson, D. J., Mccarthy, N. D., Jolley, K. A., Urwin, R., et al. Genetic analysis of meningococci carried by children and young adults. J Infect Dis. 191, 1263-1271 (2005). Tenenbaum, T., Papandreou, T., Gellrich, D., Friedrichs, U., Seibt, A., Adam, R., et al. Polar bacterial invasion and translocation of Streptococcus suis across the blood-cerebrospinal fluid barrier in vitro. Cell Microbiol. 11, 323-336 (2009). Laflamme, N., Echchannaoui, H., Landmann, R., Rivest, S. Cooperation between toll-like receptor 2 and 4 in the brain of mice challenged with cell wall components derived from gram-negative and gram-positive bacteria. Eur J Immunol. 33, 1127-1138 (2003). Laflamme, S., Rivest, S. Toll-like receptor 4: the missing link of the cerebral innate immune response triggered by circulating gram-negative bacterial cell wall components. FASEB J. 15, 155-163 (2001). Zughaier, S. M. Neisseria meningitidis capsular polysaccharides indice inflammatory responses via TLR2 and TLR4-MD-2. J Leukoc Biol. 89, 469-480 (2011). Yamamoto, M., Yamazaki, S., Uematsu, S., Sato, S., Hemmi, M., Hoshino, K., et al. Regulation of Toll/IL-1-receptor -mediated gene expression by the inducible nuclear protein IkappaBzeta. Nature. 430, 218-222 (2004). Lorenz, J., Zahlten, J., Pollok, I., Lippmann, J., Scharf, S., N'Guessan, P. D., et al. Legionella pheumophila-induced IkappaBzeta-dependent expression of interleukin-6 in lung epithelium. Eur Respir J. 37, 648-657 (2011). Jaerve, A., Muller, H. W. Chemokines in CNS injury and repair. Cell Tissue Res. 349, 229-248 (2012). Schneider, H., Weber, C. E., Schoeller, J., Steinmann, U., Borkowski, J., Ishikawa, H., et al. 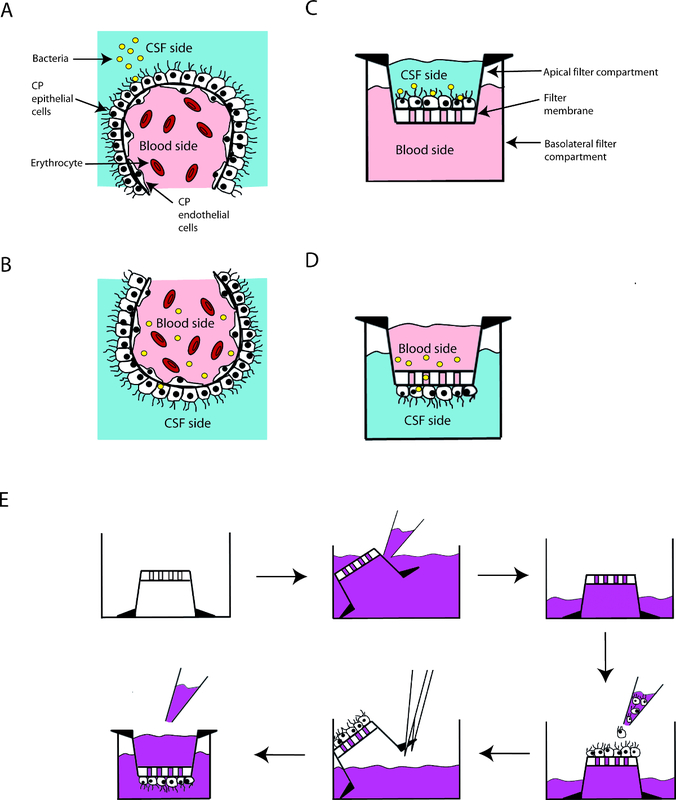 Chemotaxis of T-cells after infection of human choroid plexus papilloma cells with Echovirus 30 in an in vitro model of the blood-cerebrospinal fluid barrier. Virus Res. 170, 66-74 (2012). Chodobski, A., Szmydynger-Chodobska, J. Choroid plexus: Target for polypeptides and site of their synthesis. Microsc. Res. Tech. 52, 65-82 (2001). Dickson, P. W., Schreiber, G. High levels of messenger RNA for transthyretin (prealbumin) in human choroid plexus. Neurosci. Lett. 66, 311-315 (1986). Stylianopoulou, F., Herbert, J., Soares, M. B., Efstratiadis, A. Expression of the insulin-like growth factor II gene in the choroid plexus and the leptomeninges of the adult rat central nervous system. Proc Natl Acad Sci USA. 85, 141-145 (1988). Lim, L., Zhou, H., Costa, R. H. The winged helix transcription factor HFH-4 is expressed during choroid plexus epithelial development in the mouse embryo. Proc. Natl Acad. Sci. USA. 94, 3094-3099 (1997). Vandenhaute, E., Stump-Guthier, C., Lasierra Losada, M., Tenenbaum, T., Rudolph, H., Ishikawa, H., et al. The choroid plexus may be an underestimated site of tumor invasion to the brain: an in vitro study using neuroblastoma cell lines. Cancer Cell Int. 15-102 (2015).